While my son is still a bit too young to be officially diagnosed with ADHD (Attention Deficit Hyperactivity Disorder), he has been officially diagnosed by a licensed child neuro-psychologist as having ODD (Oppositional Defiant Disorder). 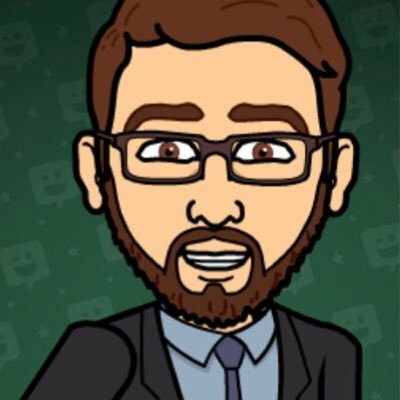 The psychologist has also indicated that the ADHD diagnosis is likely to come as he enters school age (he is just turning five years old and will *hopefully* go to kindergarten next school year). We adopted our son from the Clark County foster care system here in Las Vegas, Nevada. While I haven’t yet written publicly about the details of his exposure, I have posted that he experienced pre-natal chemical and physical trauma. Beyond all the technical jargon, simply stated, my son, is very angry and very hyperactive. He says “no” to everything, is very physically aggressive, and is almost always in constant motion. When I talk to others about his constant movement, I often hear, “that’s just how boys are; they don’t stop moving.” But my son seems to take it to next level beyond most other boys, and the ODD makes things even more difficult. We removed him from multiple daycare facilities because he had no problem saying “no” to the adult caregivers for even the simplest of requests, often screaming at them and even hitting them. He is quick-tempered, will throw large, extended, tantrums and would hit other kids on a daily basis. He refused to nap and would run around the room, jumping on the cots while screaming and yelling, waking other kids during nap time. We’ve tried multiple nannies but they all quit; exhausted. The last one quit after our son nearly broke her nose during a rage tantrum. He kept running at her trying to hit her, and when she finally (and mistakenly) tried to hold him to calm him down, he tried pulling her hair, and when she grabbed his hands, he lashed with his head and got her on the nose. In both daycare and other environments, he struggles to be a part of a group. At daycare, when other kids were doing a group activity, my son would be off to the side doing his own thing. When the adult caregivers would try to corral him over to the group, he would refuse and disrupt the whole class. Often his disruptions led to the rest of the class getting out of control, as the kids closer in the spectrum to his behaviors would peel off from his example. A typical daycare caregiver does not have the training to deal with a typical child, let alone a child like mine. I had him in indoor soccer for a while, but he wouldn’t follow the group. All the other kids would be running up and down the field doing whatever the coach told them to do, and my son would be off on the side throwing the cones (or whatever training props were available) at the kids on the field, or spinning in circles and banging his head against the side wall. 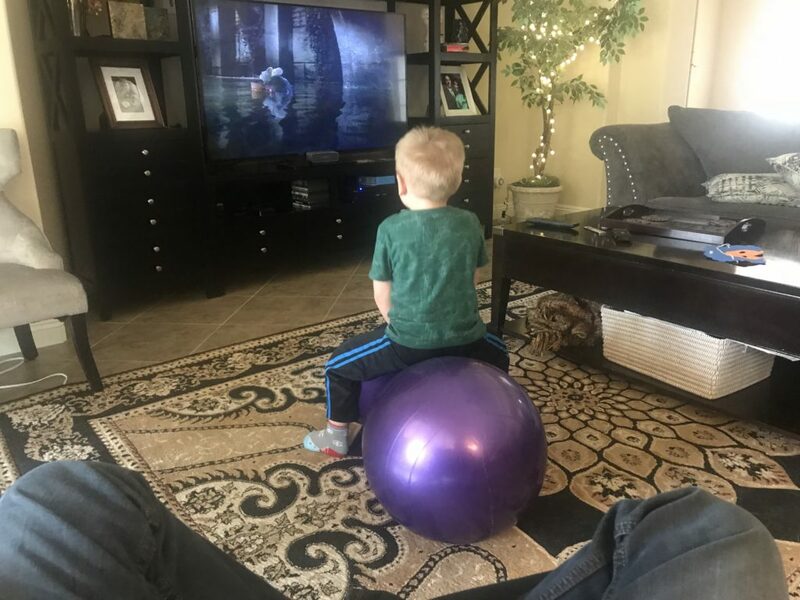 When we let our son watch tv, he most often doesn’t sit and watch. 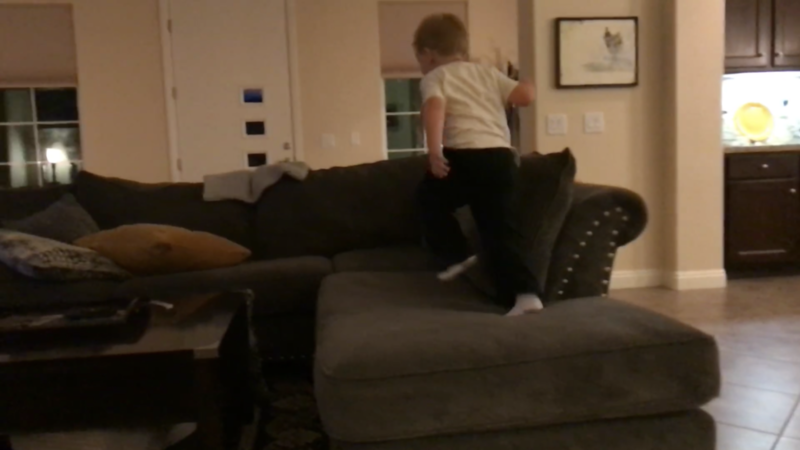 He’ll often climb and jump all over the couch for an entire movie, and that can be after running and jumping around at a park for an hour. Since he’s not allowed to jump and climb on the couch, we often take a cushion off of the couch and let him jump on it on the floor. Or we have gym balls and a Hippity Hop Ball (Walmart) / Hippity Hop Ball (Amazon) that he often bounces on. In the picture above he is on a Peanut Ball I purchased from Walmart. Or you can get a Peanut Ball on Amazon . Just the other day, we were at a party, and he jumped on the trampoline for nearly three hours. Other kids took shifts leaving and coming back, but he was on there the entire time. He outlasted them all and was sad when he was the only one left jumping. We’ve done a lot to work with him, and that’s yet another article that I’ll write. Suffice it, for now, to say we have a team of workers that work with him. He currently has a BST (Basic Skill Training) worker, a PSR (Psycho-Social Rehabilitation) worker, occupational therapy, a neuro-psychologist, and a psychologist. Luckily we fought for Medicaid during the adoption process, or we’d be completely broke from the expenses. He also attends pre-school in Clark County’s early childhood program, Child Find where he gets training from a special education teacher. And along with this whole ride, I’m getting a street version of a master’s degree in behavioral modification, which is what it takes to get through a day with my son. When it comes time to do a non-preferred task, like reading, it can be difficult to get my son to participate. 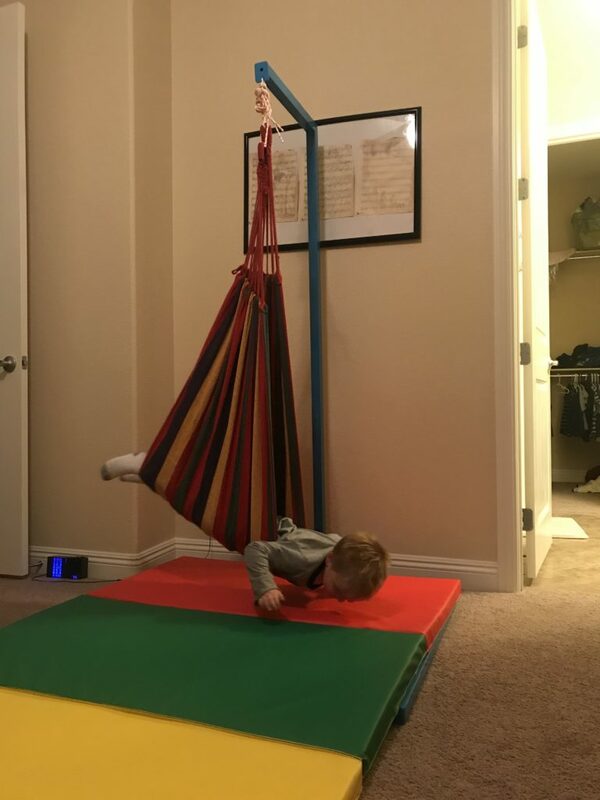 Recently we built a swing for his room, which you can read about in my review of the In-Yard Therapy Swing we purchased. Beyond giving him another way to release energy, the swing turned out to be a great tool to help him lean to read! I modeled the idea after something I saw his occupational therapist had him do. She had him on a swing, and he would pull himself towards her on a rope, of which, she was holding the other end. When he worked his way up to her, she would hand him a bean bag. Then he would let go of the rope, swing, and try to throw the bean bag in a bucket. Often, as part of his therapy, his occupational therapist combines movement with learning. 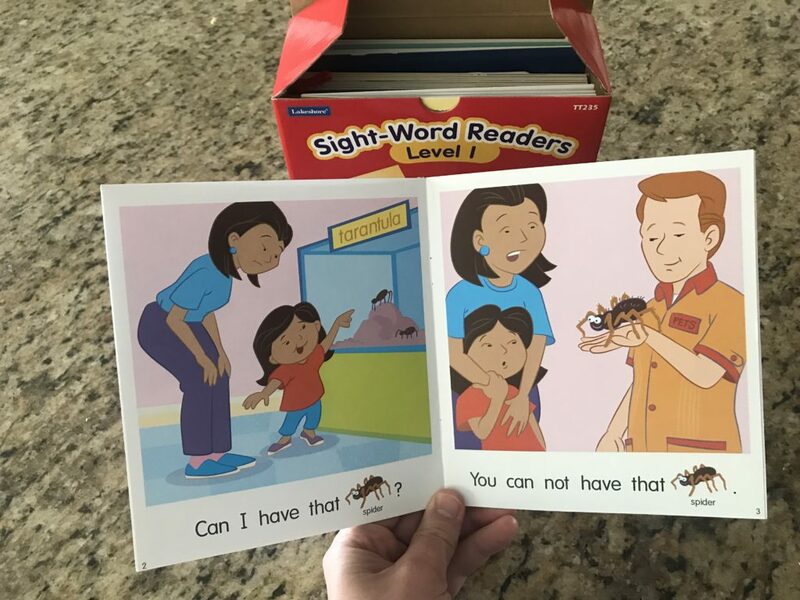 For Christmas, a very aware aunt sent him a “sight words” reading book (Sight-Word Readers – Level 1 – Lakeshore Learning) as a Christmas present, as she knew he is budding the age of learning to read. If I sit my son in my lap and try to get him to read, he often won’t even try. If he does try, he will squirm around and often will throw a tantrum after the first or second time he struggles, flailing his body in anger. It was frustrating for him and me. So one day, thinking back to his occupational therapy, I picked up a sight words book and put him in the swing in his room. 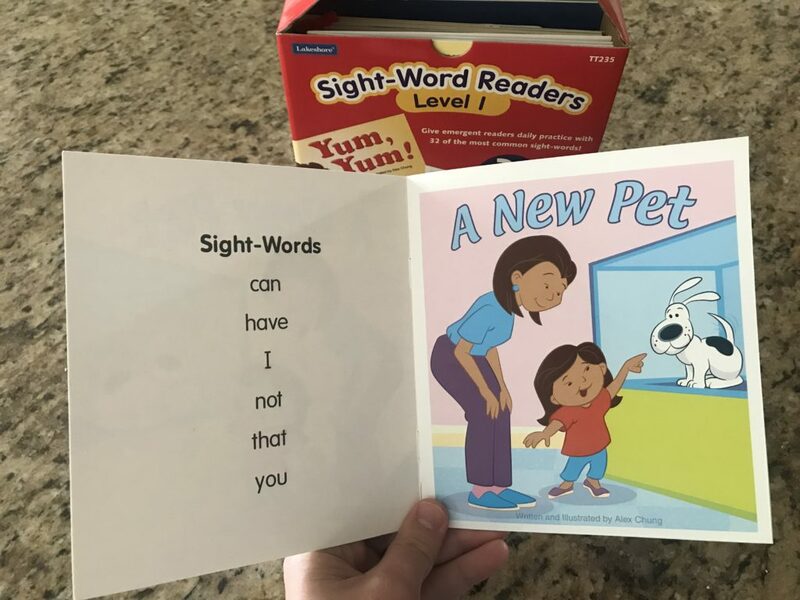 The first page of the book has the list of sight words. So I had him swing over to the book and point to a word. I’d tell him the word and have him say it back to me. With each page, I asked if he saw his word on it. If he saw his word, I’d have him swing over and point to his word. Then he’d have to say it again. Finally, I’d read the sentence, pointing to each word as I said them, and he was to say his word when I pointed to it. 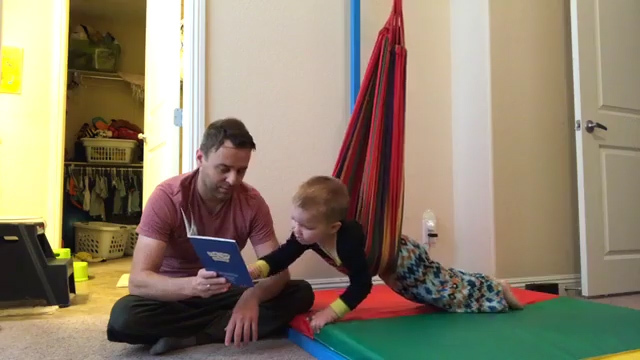 So that’s been working well, and there are even times where he asks me if we can read on the swing! I have always been a do-it-yourself type of person, which has always included managing my own savings and investments. I've been successfully investing in the stock market for almost 20 years and beyond my personal blog, I also write another blog from the perspective of a father and family man about how I invest for the long term. Thanks for reading my blog. If you'd like to be notified when I write another article, please join my newsletter below. You can also follow me on Facebook or Twitter . I don’t sleep well anymore… I Snore. Do I have Sleep Apnea? Do I need a CPAP Sleep Machine?